Rotator cuff stretches are important exercises to prevent swimmer’s shoulder, a shoulder injury which can be caused by incorrect swimming technique and overtraining. FTC Disclosure: I get commissions for purchases made through some of the links in this article. The rotator cuff muscles and tendons stabilize the shoulder joint and allow the arm to rotate internally, to rotate externally and to abduct. When you swim a lot, the internal shoulder rotators and chest muscles grow stronger and shorter while the external shoulder rotators and scapular stabilizers don’t become as strong and have a tendency to stretch over time. Muscular imbalances result that can lead to rotator cuff problems. Shoulder stretching exercises allow the internal shoulder rotators and chest muscles to recover their length and contribute to the shoulder’s health. Other essential aspects of swimmer’s shoulder prevention are correct swimming technique and rotator cuff strengthening exercises. Take a towel or a belt, hold it with both hands a little bit more than shoulder-width apart. Your arms are extended. Slowly lift the arms in front of you, then further above your head and to the back, until you feel a stretch in your chest. Hold that position for 30 seconds, then release. Stand upright, with arms hanging relaxed to the sides. Arms still extended, bring them behind you, palms facing each other, then clasp the hands together. Now raise your extended arms behind you until you feel a stretch in the chest. Stand next to a wall. Lift your arm to the side, bend your elbow until your upper arm is horizontal and your lower arm points straight to the ceiling. Turn your palm towards the wall and rest your arm against it while keeping the 90° angle. While holding the arm against the wall, rotate the opposite hip away from the wall until you feel a stretch in the front of your shoulder and chest. Bring your extended arms above your head, on hand on top of the other, like in a streamlined swimming position. While keeping the arms above your head, bend to the left until you feel a stretch on the side of your upper body. Hold the position for 30 seconds, then do the same on the other side. Extend the first arm, lift it in front of you until it’s horizontal, then rotate it towards the other arms shoulder. Place the second hand on the first arm’s elbow, and start to pull back the elbow until you feel a stretch at the side of the shoulder. Place the back of one hand against the lower back. The elbow sticks out at the side. Grab the forearm or elbow of the first arm with the opposite hand. Pull the elbow gently to the front while keeping the first hand on the lower back. Alternatively, instead of grabbing the first arm with the second, you can also lean the elbow of the first arm against a wall, then rotate the opposite hip away from the wall. 1) Once you feel a pull in your muscles, hold the position for 30 seconds. When you stretch a muscle, a reflex causes it to contract. The muscle needs at least 15 seconds before it relaxes and stretching becomes effective. 2) When you stretch, you should feel a light to medium pull in your muscles. If it hurts, you are stretching too hard! In that case, the muscle reflex will kick in and the stretch will be ineffective or can even injure your muscles. 3) Never bounce while stretching. Again, if you do this, the muscle reflex will kick in, and you risk creating small muscle tears. Treat Your Own Rotator Cuff by Jim Johnson, PT, is an excellent short book (about 90 pages) to consider if you have shoulder problems. It describes the anatomy of the shoulder joint, then explains how rotator cuff exercises can fix shoulder problems, and finally provides you with rotator cuff stretching and strengthening exercises you can use to get rid of shoulder pain. Highly recommended, not only for active swimmers but also for anybody experiencing shoulder problems. I swim three days a week 1,000 to 1,500m each day. I suffer from swimmers shoulder especially if I try to go harder in a session. Frustrating as I just cannot seem to increase the intensity of training. How should I incorporate these stretch exercises? Before or after training or should I give training a miss for several weeks and work on these stretches? Please bear in mind that I’m no physical therapist. But you should work on both strengthening and stretching exercises for the shoulders. Here’s a link to our rotator cuff strengthening exercises. Rotator cuff strengthening shouldn’t be done on the same day as the days where you swim, to avoid swimming with already tired rotator cuff muscles. Ideally, you’d do the stretches after the strengthening exercises, when the muscles are warmed up. 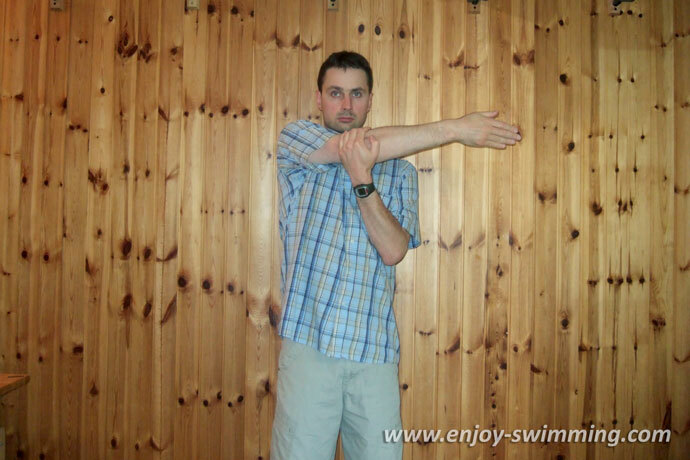 You can also do some stretches after a swim. I wouldn’t do them before swimming because your muscles aren’t warmed up at that time. Also, if you swim from swimmer’s shoulder, you should have someone check your technique, as a mistake could create the conditions for swimmer’s shoulder. Swim paddles can also contribute to swimmer’s shoulders if you use them, as they put more strain on the shoulders.